The U.S. hemp crop tripled in 2018 with acreage rising rapidly in the 24 states actively growing last year, according to advocacy group Vote Hemp, and that figure is expected to grow now that the Farm Bill has opened the door nationwide to hemp production. 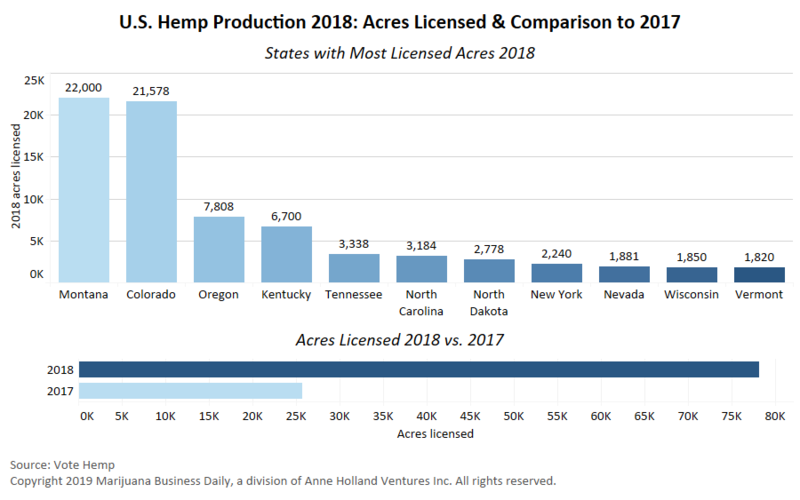 Total American hemp acreage was at 78,176 acres last year, up from 25,713 in 2017, the group estimates. Vote Hemp compiled its figures after calling each of the 41 states that have authorized hemp production to find out how many acres were licensed last year. The organization estimates that 70% of licensed acreage was planted. For hemp grown indoors, Vote Hemp considers 40,000 square feet of indoor cultivation to be equivalent to 1 acre. Vote Hemp made no estimate of how much product was harvested in 2018. Vote Hemp also noted a new top hemp-producing state, Montana, which reportedly went from 542 planted hemp acres in 2017 to 22,000 planted acres in 2018. Vote Hemp’s figures have not been independently verified by Hemp Industry Daily. With the plant’s new federally legal status, expectations are that figures will eventually be available from the U.S. Department of Agriculture (USDA), but the agency doesn’t yet have accurate acreage reports. Vote Hemp President Eric Steenstra said hemp market data is essential, so his group tallies acres by hand. “Quantifying what people are investing in the industry data has been critical to advancing hemp policy and advancing the industry,” Steenstra said. Hemp’s meteoric rise in U.S. agriculture comes as conventional farmers face low profits and market volatility in conventional commodity crops such as corn and wheat. But it remains a very specialized crop; by contrast, the USDA reports that the U.S. grew almost 90 million acres of soybeans last year. Still, hemp’s large rate of increase is likely to accelerate in 2019, given that hemp has been removed from the Controlled Substances Act and is eligible for crop insurance, farm loans and all other federally backed farm assistance programs. Some hemp farmers say they’re braced for a flood of new competition in 2019. “It’s going to get quite a bit bigger, I think,” said Brian Furnish, president of global production at Ananda Hemp, a Kentucky hemp company whose holdings include 500 acres. Those estimates do not include sales of fiber and grain products from hemp, smaller categories with limited market data. For now, the hemp industry remains mired in uncertainty, said Randall Fortenbery, an agricultural economist at Washington State University who has studied hemp’s market potential in the U.S.
“The combination of the government shutdown and states needing to get their (hemp) plans into the hands of the USDA means that there hasn’t been a lot of resources devoted to what the hemp market looks like now,” Fortenbery said.